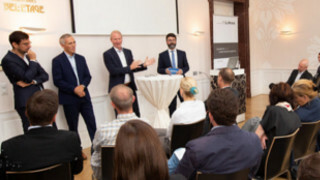 The LIMAK Austrian Business School and the newspaper DiePresse on 11th September 2018 organised a Business Breakfast in Café Landtmann. IFI professor Matthias Fink in his keynote speech emphasised the importance of digitalization for the competitiveness of companies: In order to keep the digital future successful companies now have to find adequate strategies, develop business models and create competencies for implementing all that. They have to work on different ways of organising, communicating and working. Managers in in this situation are required to find the right responses to digital transformation.